The passenger-airline employee relationship isn’t quite at an all-time high. You can’t just blame United for dragging things down. Airlines are all trying to cram more people into planes, thereby offering them less comfort. They’re running with very tight margins, so one delayed or canceled plane can lead to many other flights being affected. No matter how they try to spin it — and, goodness, do they try — it’s not going to get better. Still, humanity occasionally peeks through. Let’s go then to New Orleans airport. For reasons that aren’t entirely clear, the gate agent demanded a fee of anyone asking questions. This is New Orleans. It’s different there. This is also Southwest, which has spent months pumping out ad after ad of its own employees miming to classic hits. At first, passengers seemed bemused. Could it be that this nerdy-looking man had temporarily mislaid his mental equilibrium? Could it be that the airline had lost it for him? His gusto, though, carried him through. The performance was good enough for other passengers and the gate agents to join in. It was good enough for the man to enjoy rapturous applause. Which leads me to several conclusions. 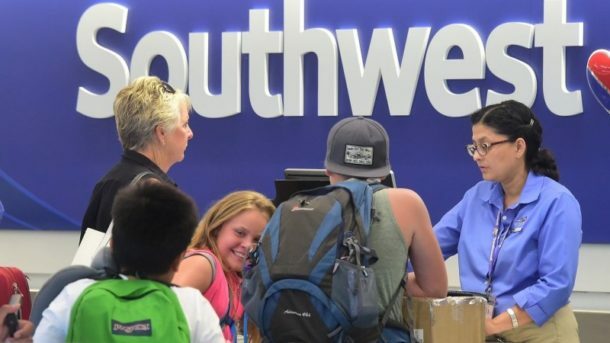 One, how lovely that Southwest employees are still allowed to enjoy themselves. At least occasionally. I have had little luck with the airline this year. Once, it simply flew off without me and several others, despite telling us that the flight wouldn’t leave for another hour. Then its entirely non-cheery staff refused to help us at all. And last week, just as I was about to board a flight, the airline canceled it, which meant I couldn’t get to my meeting in time and had to turn back. On this evidence, however, Southwest clearly employs a number of very entertaining people. Which leads me to a confounding thought. What if, instead of dragging Dr. David Dao off the plane in Chicago — an incident that defined United in so many eyes –, the airline had held a sing-off to choose which passenger would be bumped? Might the course of its last few months have been any different?